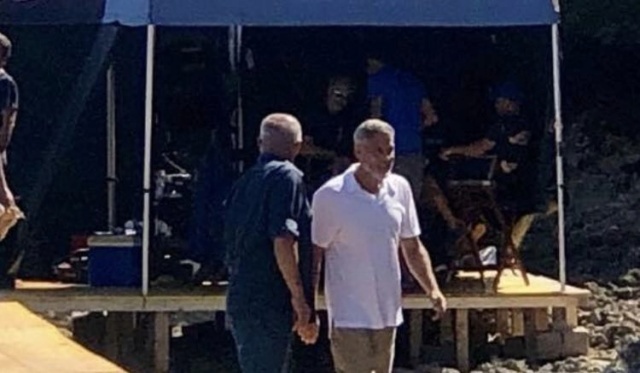 George Clooney was spotted celebrating with the crew as Catch 22 finished filming in Santa Teresa Gallura, Italy. Clooney has been in the European country all summer as he split time between filming the Hulu limited series and spending time in his Villa in Lake Como with wife Amal Clooney and their 1-year-old twins Ella and Alexander. Clooney, 57, was seen wearing a white polo over khaki pants and white sneakers for his last day of shooting last week. The wrap comes just a month after the actor got into a serious scooter crash on his way to set. it's me wrote: Still there? I don't know ... you have to ask "People" magazine. It's Me - The article says it was last week. You two need to do more than look at the pretty pictures!